The ancient synagogue of Peqi’in was built, tradition relates, following the destruction of the Second Temple, on the remains of the House of Study of Rabbi Yehoshua ben Hananya, a Levite. R. Yehoshua was appointed head of the Sages after the death of Rabban Gamliel, his adversary, in 130. The wisdom or R. Yehoshua was well known in his generation, particularly in debate and controversy. “I have never been triumphed [in argument] except for by a woman, a lad, and a maiden,” said R. Yehoshua to himself (BT Eruv. 53b). One theory maintains that R. Yehoshua arrived in Peqi’in due to the differences between him and the Nasi, Rabban Gamliel. The scholar A.M. Luntz claimed that R. Yehoshua ben Hananya moved to the Galilee because the Sanhedrin had relocated there. 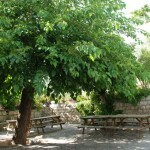 When R. Shimon and his son were fleeing the Romans who sought to kill them, they hid in various places in the Galilee. One of their hiding places was R. Yehoshua ben Hananya’s house of study in Peqi’in. After a long stay in the house of study, they arrived at the famous cave in Peqi’in where they hid for 13 years and where, according to tradition, Rabbi Shimon bar-Yohai wrote the Zohar. 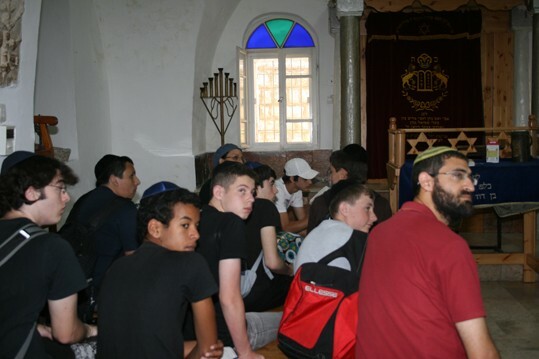 The synagogue is an impressive living testimony to the existence of the ancient Jewish settlement in Peqi’in, which began during the Second Temple period when R. Yehoshua’s house of study was teeming with life and Torah study. Scholars state that following the destruction of the Second Temple, priestly families arrived from Jerusalem to the Galilee, and a number of them settled in Peqi’in. According to the tradition of local residents, who all trace their lineage to the priestly divisions who performed rotations in the Temple while some even trace their lineage to R. Yosei of Peqi’in,, their forefathers brought stones from the Temple to the synagogue. These stones were engraved with a menorah, an etrog and a lulav, as well as an image depicting the Nikanor Gate, one of the gates of the Temple. The ancient synagogue was made of wooden beams and red loam, and was severely damaged in the great earthquake of 1837, and in two additional quakes. The roof collapsed totally, and the building itself also suffered extreme damage. 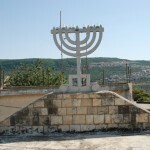 In 1873, the rebuilding of the synagogue on the ruins of the ancient structure was completed. The initiative and contributions for reconstruction arrived that same year from a wealthy man from Beirut, Raphael Ha-Levi. A Jewish minister and commander in Lebanon, Ha-Levi noted during a visit to Peqi’in that the synagogue leaked in winter, and ordered that the wooden roof, which had thoroughly rotted, be destroyed and replaced with a concrete structure. In addition, the walls were whitewashed, the shutters and door renovated and painted, and a new curtain placed over the Ark. 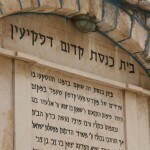 To this day, a plaque rests above the lintel, honoring the generous contribution of Rabbi Raphael Ha-Levi. In 1883, Sir Lawrence Oliphant, one of the righteous gentiles, visited Peqi’in and enjoyed the clear and healthful air, the beauty of the place, its many fruits and good water, and made a donation for an overhaul of the synagogue. In the extensive renovations undertaken thanks to his support, the stones that had been in the ancient structure were embedded in the new. And indeed, according to the tradition of Peqi’in residents, the stones brought from the Temple were laid alongside the new building in memory of the destruction of the Temple, but were covered in plaster to prevent them from being stolen. Between 1926-1931, archaeologists examined the structure of the synagogue and reached the conclusion that the stones did not derive from the Temple, but were two ancient stone slabs that had survived from the ancient synagogue. 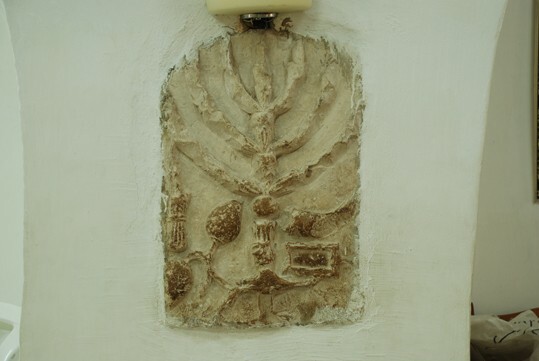 Archaeologists determined that one slab contains a relief of the Holy Ark, and the other, a relief of a lamp (menorah), date palm branch (lulav), ram’s horn (shofar) and an incense pan, sure signs of an ancient presence of Jews in Peqi’in in the days of the Mishna and the Gemara. The scholar S. Klein compared the ancient inscriptions from the synagogues and dated them to the period of R. Shimon Bar Yohai, c. 170 CE. This finding is consistent with the assertion of scholars Kohl and Watzinger, who attribute the building of synagogues in the Galilee to the end of the 2nd c. CE, the end of the Mishnaic period. 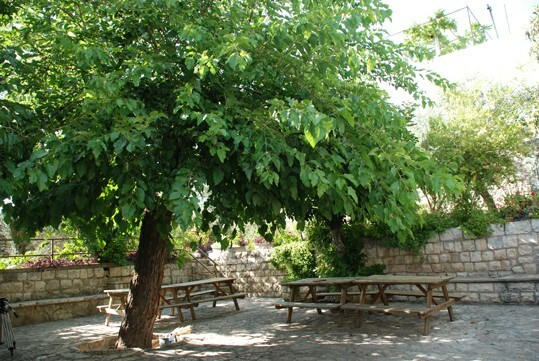 The synagogue served as a school for children in the Jewish community until 1926, when the efforts of a teacher by the name of Tzion Levy led to the construction of a Jewish school in the center of the village by the education department of the Jewish Agency, managed by the National Committee. 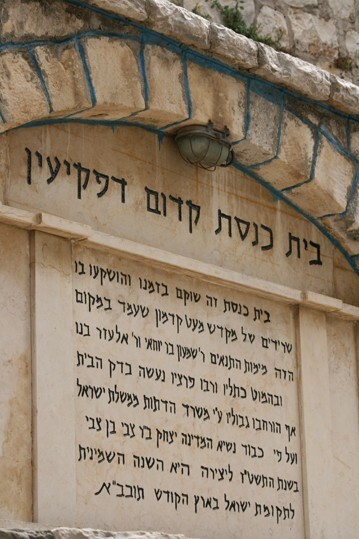 In 1930, Yitzhak Ben Tzvi discovered an additional stone, engraved with the door of a chamber. Depicted on both sides of the door are two large pillars featuring round, lines curve as snakes. The entire picture, in Ben Tzvi’s opinion, is unquestionably a picture of the Holy Ark of the synagogue, because “It can be reasoned that the stone was positioned above the actual holy ark” (Ben Tzvi, Sh’ar Yishuv, p. 39). 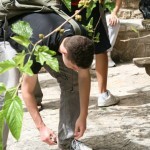 Ben Tzvi discovered the third stone in one of the Druze houses in the village, located near the Jewish Quarter and the synagogue. The stone was built into one of the house’s walls, and decorated with a bunch of grapes. 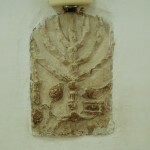 This motif, of one of the seven species that grace the Holy Land, is characteristic to ancient Jewish art. In 1950, the synagogue was renovated at the initiative of Ben Tzvi, who was at the time the first president of the State of Israel. 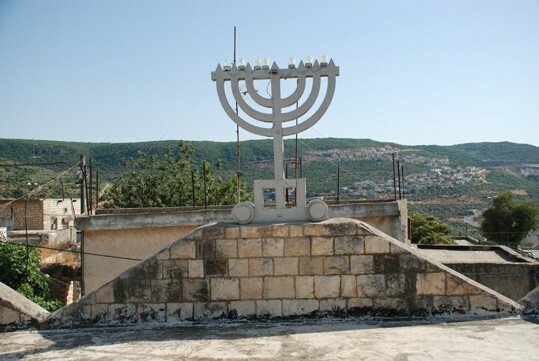 Today, the synagogue serves Jews of the Galilee who come to Peki’in and join their supplications with the many prayers recited here over thousands of years. 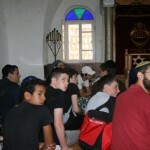 The synagogue functions as a tourist site and many visit it to celebrate joyous occasions: weddings, bar mitzvahs, and ritual haircutting for young boys (upshirn). 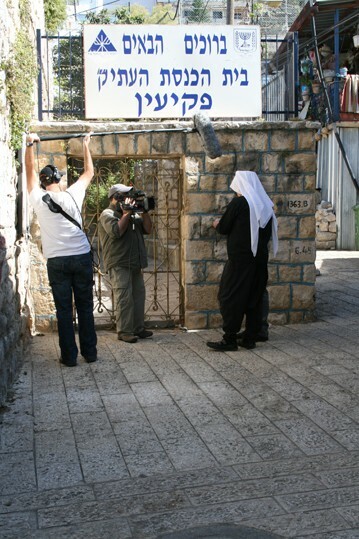 Margalit Zeinati, the last remaining descendant of the Zeinati family in the village, looks after the synagogue and attends to the upkeep of the Jewish sites in Peki’in.